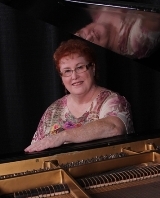 ​ Tahnia Sandra Kay Lund has been teaching piano full-time for over 35 years and enjoys helping her students to find joy in their music. While she has had many award winners and students preparing for college music degrees in her studio, she feels that the most important goal is to make sure that students love music and find self-expression in playing the piano. Private lessons are available at her studio for students from beginning to advanced levels who range from age three to adult. Both traditional piano instruction and Suzuki Piano are offered. The Suzuki Mother Tongue method is especially suited to young students and Miss Lund has extensive experience in the method. Please see the Articles & Links page for more information about the Suzuki Method. A well-rounded musical education assists students in defining what music means to them. Miss Lund's goal is to cover all areas of musicianship: Performance, technique, theory, sight reading, ear training and music history. Her teaching is based on an ergonomically correct technique for effortless playing. While her main focus is on classical, her students also enjoy popular, jazz, church and ethnic music. Graduates from her studio have chosen many different paths, including classical and jazz performance, composition, music education, music technology and pop/rock/jazz composition. Piano is also important for those going into other musical fields such as vocal and band or orchestra and especially for those wanting to direct musical groups. There are three major studio recitals each year: October, December and June. Plus students may participate in all the recitals, evaluations, examinations and competitions held by the organizations in which she is a member: the Music Teachers' Association of California, Temecula Valley Branch, the Music Teachers' National Association, the California Association of Profession Music Teachers, the Temecula Valley Music Teachers' Association, the Suzuki Association of the Americas and the National Guild of Piano Teachers. Hello! I am excited to say that I am now teaching at the Miyamoto Music Studio in Temecula just south of Old Town. If you are interested in lessons or would like to be on my waiting list please register on this website or email me at Tahniask@gmail.com or call me at 951-704-0253. I look forward to speaking with you. I am sorry that there are blank pages here. The website is currently under construction.